This Thursday is the 40th anniversary of the Apollo 11 launch from Florida's Cape Canaveral. To celebrate this occasion, animated recreations of this space mission and others after it are to be made available online for the first time. The website hosting the videos WeChooseTheMoon.org officially launches 90 minutes before the original Apollo 11 launched 16 July – although you can visit it now for a teaser countdown. Speaking about the website launch, Thomas Putnam, Director of the JFK Library said: "Putting a man on the moon really did unite the globe. We hope to use the internet to do the same thing." 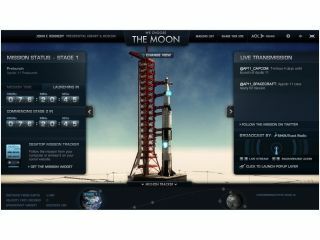 Clips on the site will include Apollo 11's first moon orbit, audio of the original transmission and as an added bonus John F Kennedy's 1961 rousing speech to Congress outlining his promise to get a man on the moon before the Seventies will also be available. The website has been created by the John F Kennedy Presidential Library and Museum in Boston. The site is being powered by AOL, who has been doing some interesting number-crunching and come up wit the below Numberwang-like facts. Enjoy. 109 hours, 24 minutes of audio transmissions streamed "as they happened"